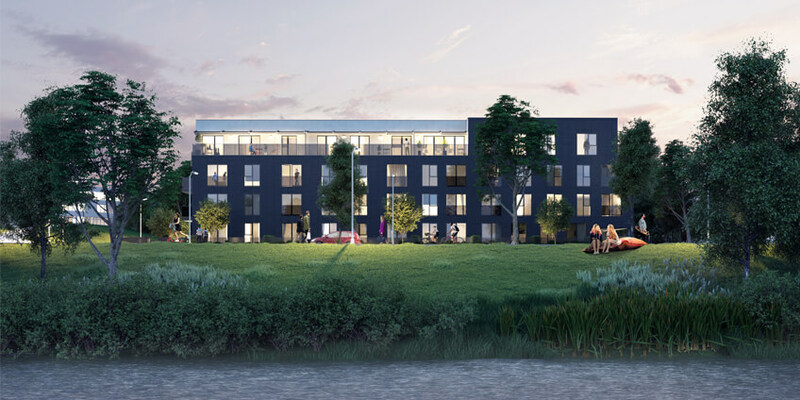 Construction works on the Antakalnio krantas project started in Vileišio Street of Antakalnis residential area in Vilnius. The four-storey apartment building will accommodate 43 apartments of 1.5 to 4 rooms, floor area from 36 to 102 sqm. The construction works are scheduled for completion in Q2 2019. The Antakalnio krantas project has been designed by Algirdas Kaušpėdas architect studio. ‘I love Antakalnis for two reasons – beautiful nature and architectural diversity. I hope that Antakalnio krantas’ by our studio JP Architektūra will help combine these two characteristics of Antakalnis to offer comfortable and joyful living,’ Algirdas Kaušpėdas, the architect and co-author of the project, said. The ground floor apartments will contain private, enclosed yards. Apartments on other floors will have balconies or spacious terraces of up to 28 sqm. The entire property will be secured with a fence and outdoor lighting, and a yard and a playground will be installed. The parking area will be monitored by video cameras and storage areas for residents will be provided in the underground parking. The building is constructed just 70 m from the River Neris. ‘The project built in an exclusive location in the capital city will form part of the architectural and natural surroundings. Although it is a small-scale project, the team has invested a lot of effort in offering well-designed technical, engineering and interior planning solutions. These have already been evaluated by the first buyers. For the convenience of the residents, wide panoramic windows, underfloor heating to ensure even distribution of heat in the rooms, and charging points for electric vehicles will be installed,’ Audrius Šapoka, Ober-Haus Residential Real Estate Department Manager, said. An integral part of the project is the riverside revival and its adaptation for recreation and leisure. The project developer will undertake to clean up the riverside in front of the building. ‘The adjacent riverside area will be cleaned up, so the residents of the first floor or higher will be able to enjoy the views of the river. The reconstruction of Vileišio Street and its adaptation for pedestrians and cyclists will be completed by the end of the completion of the project,’ Mr Šapoka noted. A section of the new pedestrian and cyclist path so popular with the cyclists in Vilnius has already been laid in Vileišio Street. In the future this path will serve as the main connection between Saulėtekis residential area, Antakalnis and the city centre. Project developer – UAB Plėtros Projektai, construction works – UAB Binkauskas ir Stašinskas, architects – UAB JP Architektūra, and development of the concept, marketing and sales – UAB OBER-HAUS nekilnojamas turtas.